Chuck's Legacy Honey (harvested by Mark Scotch in Plover, WI) will make an appearance in the podium awards somewhere. All Finishers will receive the coveted Finisher Hat, made again this year by RM-Gear. Raffle will take place during the pre-race meeting on Friday. Must be present - or on the course - to win! Black Rock Gear - Down hats x14 - $70 ea. Black Spider Hoody x2 - $119 ea. Rab Microlight down jacket x2 - $280 ea. Jackpine Vest x2 - $305 ea. 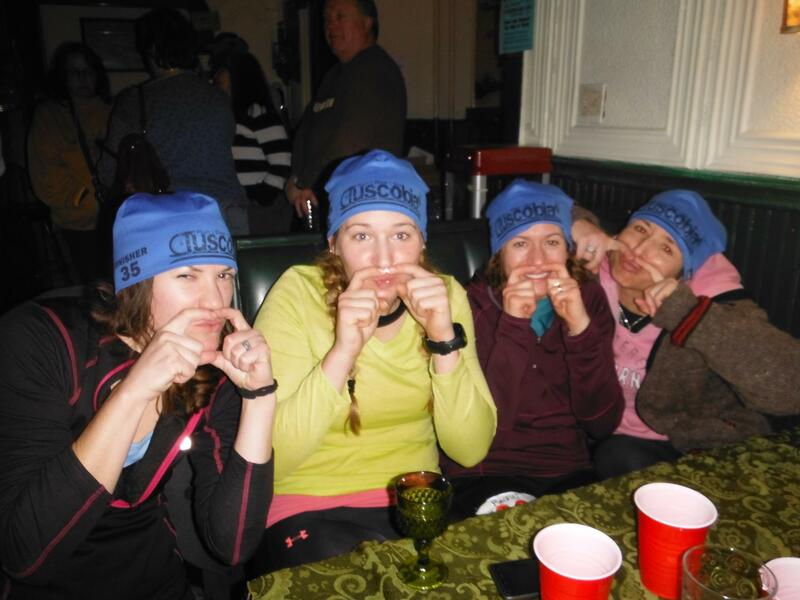 All racers (i.e., everyone who shows up) receive a Tuscobia logo items such as buff, headband, socks etc.. Also, we give all racers "Chamber Dollars" in lieu of a pre-race meal - these are redeemable pretty much anywhere in Rice Lake. All racers are entered into the raffle where we give away goodies from partners including a grand prize which has to date been a fat bike frame set. The raffle typically takes place at the larger pre-race meeting (i.e., for the 160-mile bike and 80-mile racers). Must be present to win (or already on the course if you are a 160-mile foot/ski participant). 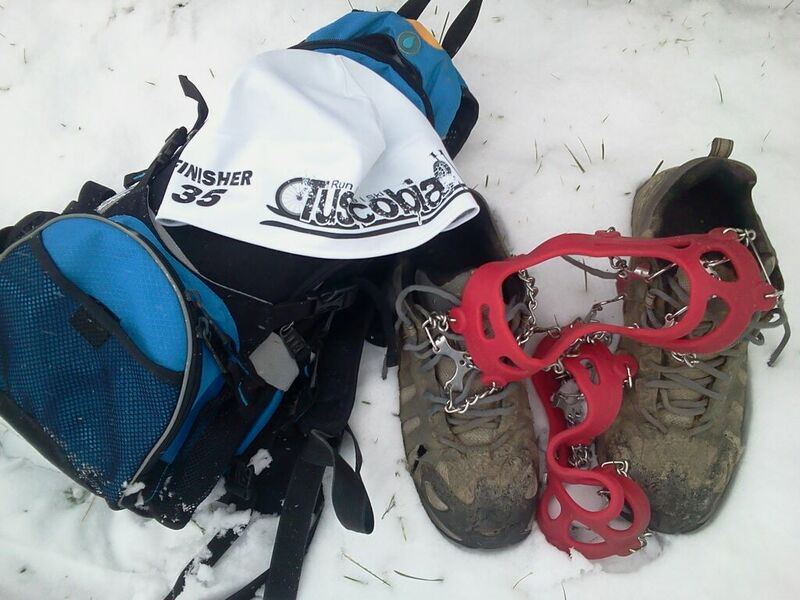 will receive a pair of Fitsok ISW socks, customized for the Tuscobia Winter Ultra. A wool blend sock perfect for winter. First, Second or Third in their race distance (150, 75 or 35), mode of transport (Run, Bike or Ski) and gender (Male or Female only) will receive a laser engraved, locally harvested, wood "round" trophy from Signature Signs in Butternut, WI. Potentially 54 awards for a field of 160. Still borderline "everyone should get a prize" philosophy. Still, almost as bad as a 10k road race.... I am going to have to rethink this for next year.....again. First place winners in each distance, mode of transport and gender will receive either local maple syrup from Northern Wisconsin Maid, with special thanks to John Slack, or local honey, with special thanks to Mark Scotch. In all three RUN races, First ($30), Second ($20) and Third($10) place male and female will receive a gift certificate to TC Running C0 , with two locations in the Twin Cities. Phone sales are taken for out-of-towners. In all three BIKE races, First ($30), Second ($20) and Third($10) place male and female will receive a gift certificate to fatbikes.com , the internet home of 9:Zero:7 bikes. In all three SKI races, First ($30), Second ($20) and Third($10) place male and female will receive a gift certificate to Out There Nordic Sports , located in Rice Lake on the Western end of the Tuscobia Trail. Online and Phone sales are taken. will receive a SweatVac 60/40 beanie, customized with the Tuscobia Winter Ultra Logo and the race distance. Below are pictures of past year's beanies. White (2011) and Blue (2012). First place winners in each distance, mode of transport and gender will again receive local maple syrup from Northern Wisconsin Maid, with special thanks to John Slack. In all three RUN races, First ($30), Second ($20) and Third($10) place male and female will receive a gift certificate to TC Running C0 , with two locations in the Twin Cities. Phone sales are taken for out of towners. First place Female winner in the 150 Run, Bike and Ski will each receive a Minne-Skirt. These things are pretty sweet, and I (Chris) have trying to convince them to make one for me. First place Female winner in the 75 mile Run, Bike and Ski will receive a Chicked T-shirt. First place Female winner in the 35 mile Run, Bike and Ski will receive a Chicked T-shirt. Raffle: Additional items will be randomly raffled on Sunday afternoon. Eligible to racers that toe the start line. 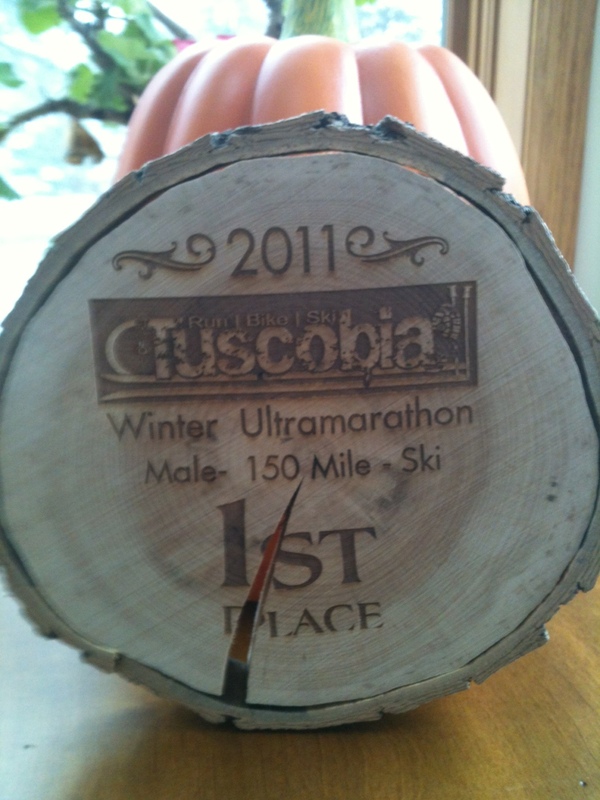 - Finishers that place First, Second or Third in their race distance (150, 75 or 35), mode of transport (Run, Bike or Ski) and gender (Male or Female only) will receive a laser engraved wood "round" trophy from Signature Sign in Butternut, WI. Potentially 54 awards for a field of 120. Borderline "everyone should get a prize" philosophy. Almost as bad as a road race.... I am going to have to rethink this for next year.....See the picture below - it will be updated with 2012 replacing 2011. Pumpkin not included. - First place winners in each distance, mode of transport and gender will also receive local maple syrup from Northern Wisconsin Maid. Considering the sap drought this past winter, this prize is worth its weight in gold. - In the 150 mile race, the first place Female in the Run, Bike and Ski will receive a $150 gift certificate from Vi Endurance. - In all three RUN races, the Male and Female First place winners will receive vouchers for free shoes from TrekSta. Choices of shoes are: Edict, Edict GTX, Evolution II, or Evolution GTX. Prize is valued at roughly $150 each depending on which model the winner chooses. - Door Prizes - more information on Door Prizes to come. Will be random drawings and all entrants will be eligible to win.